The King of Bethlehem Firemen is a tribute to one of Pennsylvania’s most popular firemen. 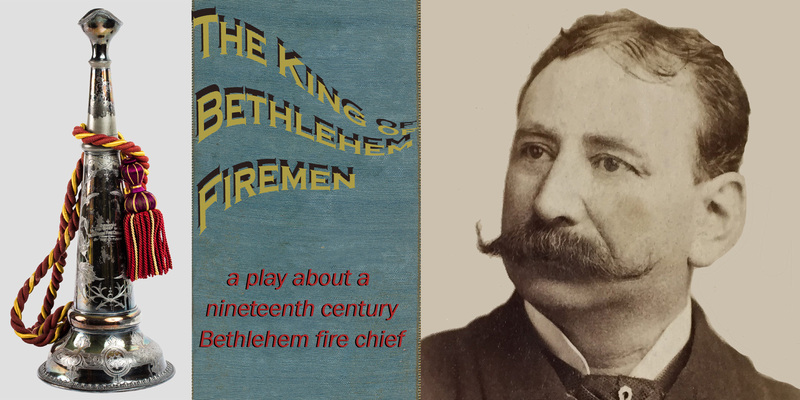 Perseverance Publishing is proud to announce the premiere of The King of Bethlehem Firemen, directed by George B. Miller, starring Chris Simmons, and written by Karen M. Samuels. “[We] will ever cherish the memory of Brother Seckelman as that of an enthusiastic fireman, one whose heart was in his work, who took a pardonable pride in being a firefighter, and one who kept abreast of every idea and movement to advance the firemen’s cause, and, consequently, the welfare of the people. The program will begin with a brief multimedia presentation on early firefighting in Bethlehem. The presentation and play are both based on the book Firefighting in Bethlehem, Pennsylvania, 1742–1917, by Chris Eline, Nancy Rutman, and Karen Samuels, published by Perseverance Publishing LLC in 2017. Award-winning director George B. Miller was the former director of the Theatre Outlet and currently is the artistic director of Selkie Theatre, an Irish/American Theatre Company in the Lehigh Valley. Miller has had great success in directing every type of theater; drama, comedy, musical, experimental and historic plays. Chris Simmons is a Lehigh Valley/New York City based actor, writer and musician. For forty years Chris has produced, directed and performed in “An Evening At A British Music Hall” in the Lehigh Valley, Philadelphia and New York City. He has also appeared in one-man shows, radio dramas, musicals and stage plays. He is currently at work on a one-man show entitled “The King Of The Bowery- Chuck Connors, The Mayor Of Chinatown”.